This is a LONG list this year! 31-34. 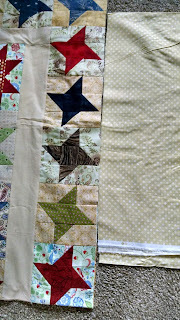 Scrappy Charity Sewing, more here! 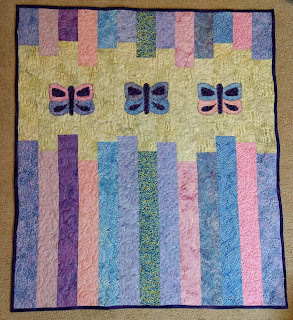 This quilt is done but I haven't had time to take pictures yet! This is even more than I expected to have finished this year. I don't typically set a goal for a number of finishes -- but I do try to finish two things a month -- and this year I nearly doubled that! 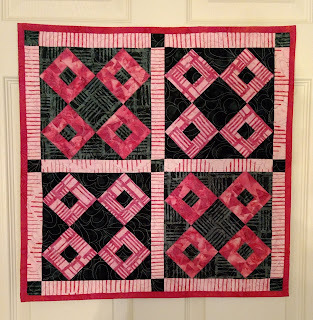 Despite the fact that I was out of state away from my sewing machine for nearly 5 days, I did manage to complete Clue #5 before Clue #6 came out last week. On the Friday Clue #5 was released, I got home from work early and managed to get the clue nearly completed in fits and bursts throughout the evening that day. By the time we left for Ohio for Christmas, I had all of the units sewn and ready for their final pressing and trimming. The day we got back, after unpacking and a quick trip to the grocery store, the units were pressed and trimmed. This was another quick and easy clue, and especially so making only half of the prescribed number of units. These units are mirror image sets -- left and right facing, or clockwise and counterclockwise, whichever naming convention you prefer. On a side note -- what do you call these units? I usually call them ribbon units since it reminds me of folded ribbon. I used three different aquas in this step and seven different dark blues. 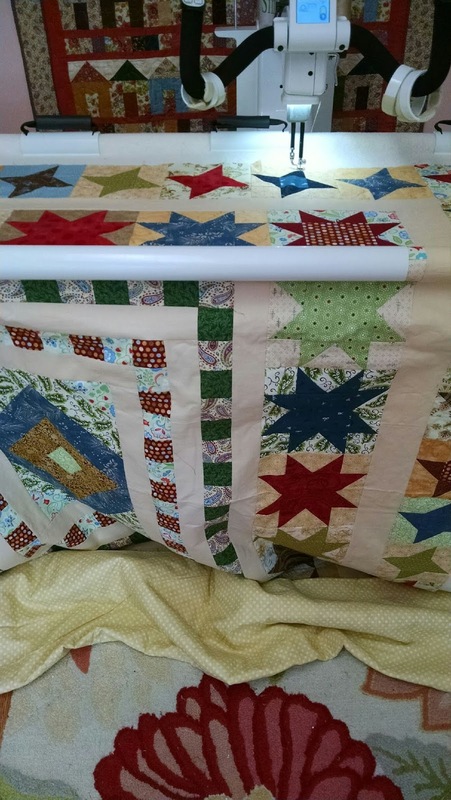 The three different patriotic prints were not ones that I had originally pulled for this quilt and they originally were featured in my Uncle Sam wall hanging. A couple dark blue prints were charm squares given to me by a friend. 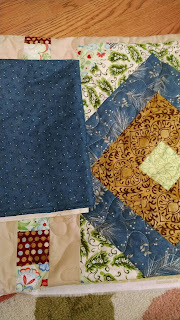 The aqua paisley print was also used long ago for a baby quilt, the dot is leftover backing fabric (featured in quite a few of my recent quilts! 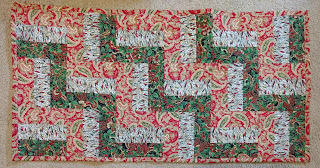 ), and geometric lace print is from my Meadow Dance pocket hanger. 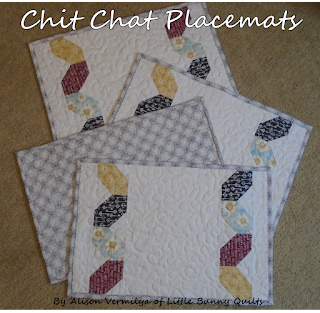 For Clue #6, we've been instructed to make neutral string pieced strips, similar to Clue #4. 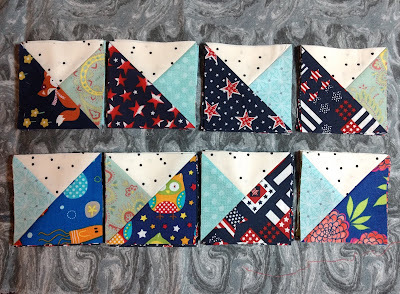 Bonnie's caveat for those who might not want to strip piece these units and use a single fabric for the rectangles is to skip this clue and come back to it once the reveal happens. For now, I am not planning to strip piece those units and will cut the necessary parts from my background fabric when I need them. 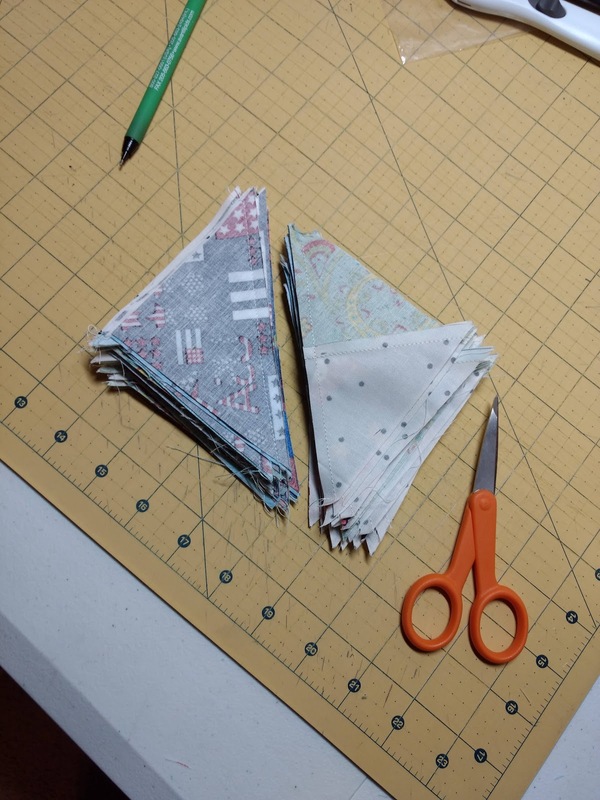 Measuring my remaining background fabric, I am more than likely going to need to order more of this dot print to finish the quilt so it's probably better to wait to see how those units will be used. I also am totally fine with "skipping" a clue for now, as the progress of packing and moving has begun! We closed on our house on Friday and have big plans for painting before we move next weekend. I still have one finish for 2018 to photograph and post -- hopefully that will happen on Sunday! Yesterday it rained the entire day so hopefully I can at least get a few pictures today. 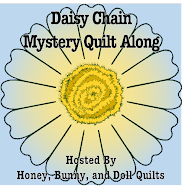 Sharing at Bonnie's Mystery Monday Link up! 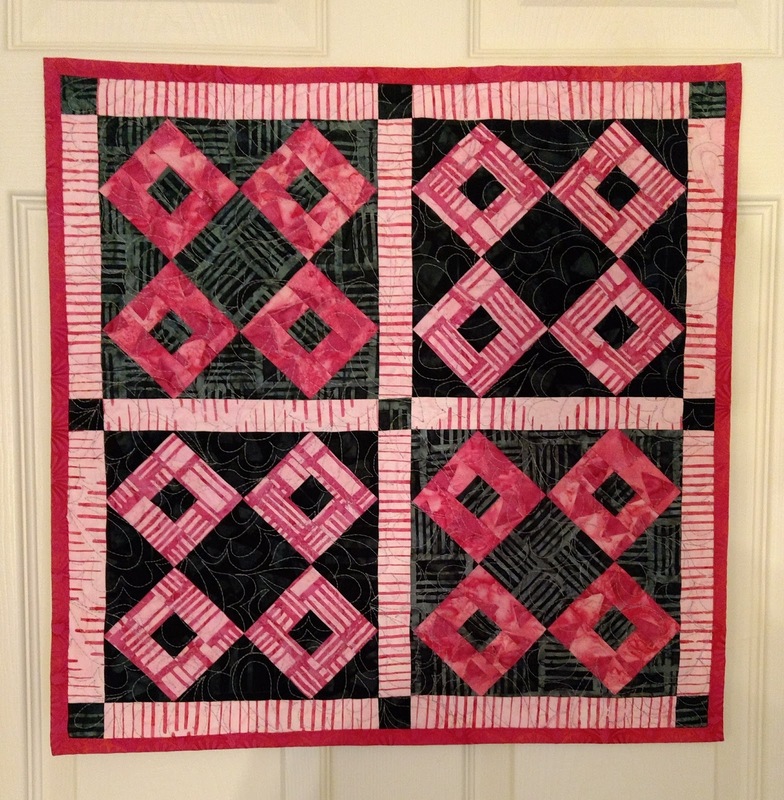 In November, I sent off my Border Quilt top with my mom for her to quilt. 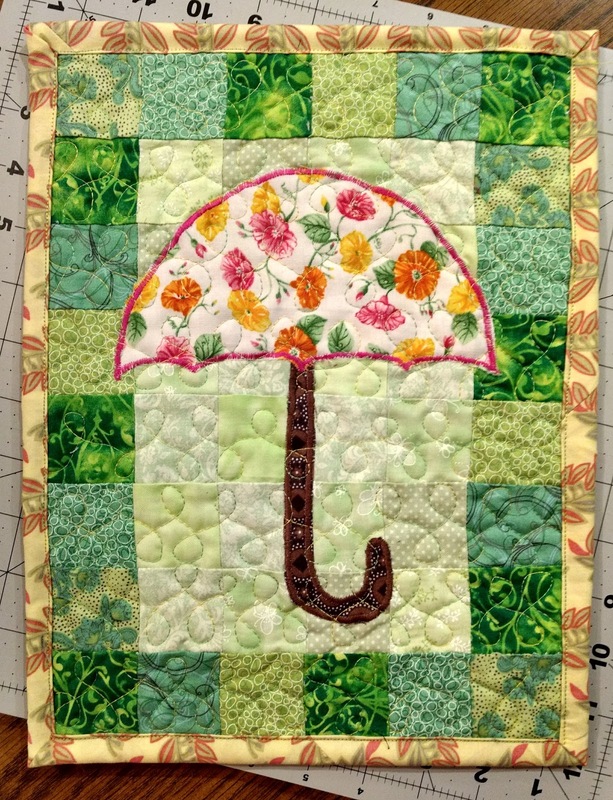 My intention was always for this to be a gift for my mother-in-law (as these colors are right up her alley!) 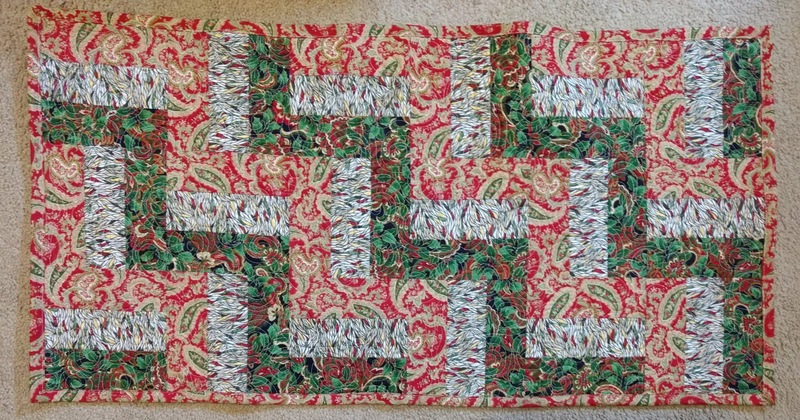 and having my mom quilt it was really the only way it was going to get done for Christmas. For the backing, we picked out this gold dot extra wide print. My mom tells me that the bolt says that it is "tan" but it is most certainly a gold toned fabric. 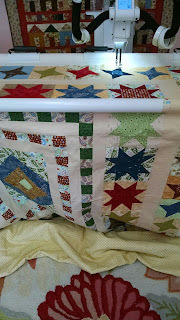 Getting the first shot of a quilt on my mom's frame is always exciting! 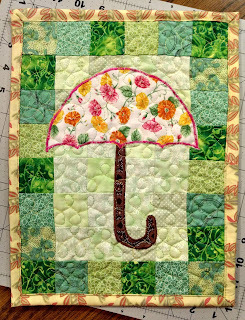 She quilted a simple stipple all over the quilt. She also was wonderful and volunteered to bind the quilt for me -- she found the perfect blue print in her stash to go with the blues in the quilt. She said that this will be the perfect quilt for her couch for the "in-between" seasons -- when it is neither baseball season nor the Christmas season. 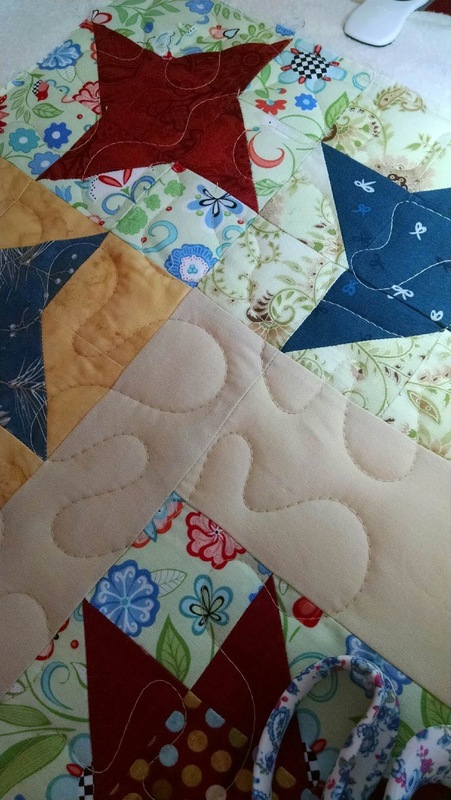 Many thanks to my husband, who has reached professional status with his quilt holding abilities. 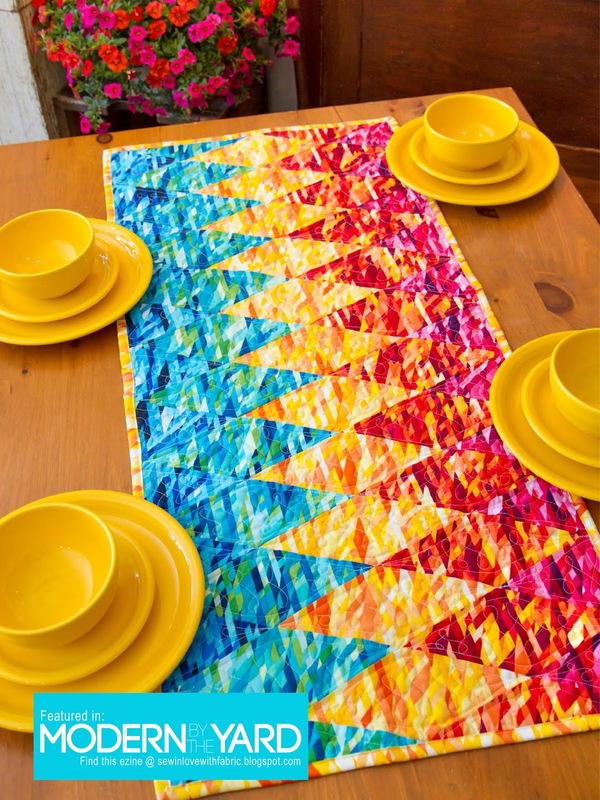 Size: Approximately 65" x 72"
It's the end of the year -- so that means it's time for the best of 2018! 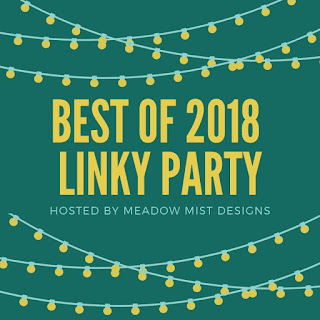 Cheryl from Meadow Mist Designs hosts this party every year and it is so fun to see what people like to highlight from the year. 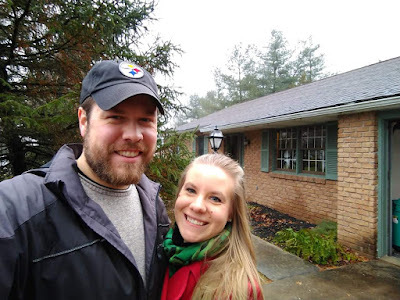 Check out my post from last year! I decided to keep my "categories" similar to the ones that I used last year. 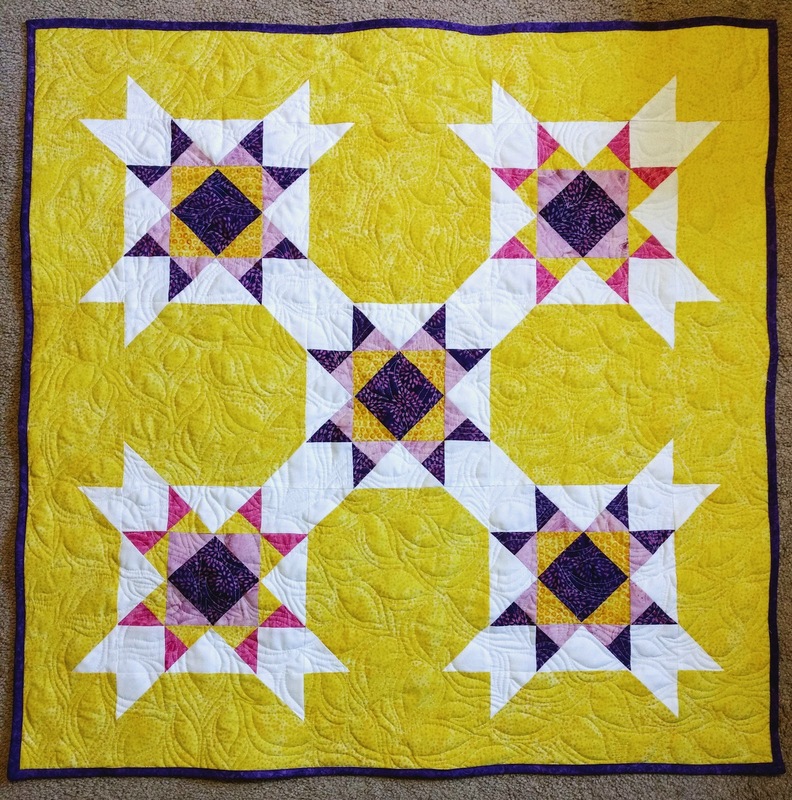 All of my blog posts (and IG posts) about my Bonnie Hunter projects are *very* popular! I made this quilt as part of the Modern Plus Sign Quilts blog hop! 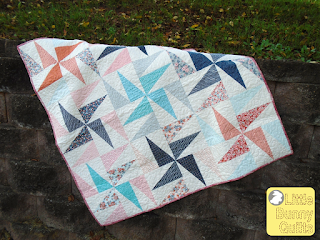 This ranks among my favorite projects *ever* because I designed and made this quilt just for me. I designed this quilt for an Island Batik blog hop and also made a baby sized version. 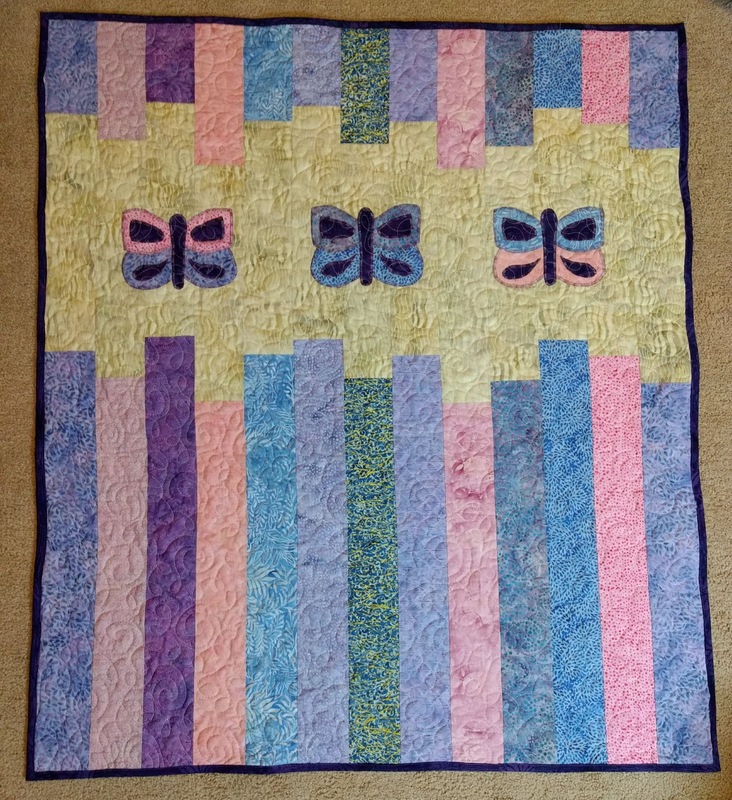 This top was started in 2016 as part of a traveling quilt bee and finished this year. 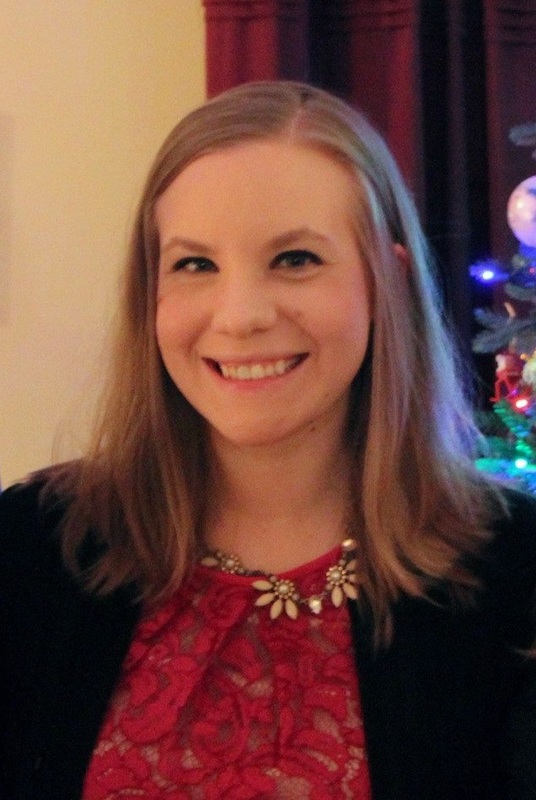 I'll have my full run-down of 2018 finishes posted on New Year's Eve! 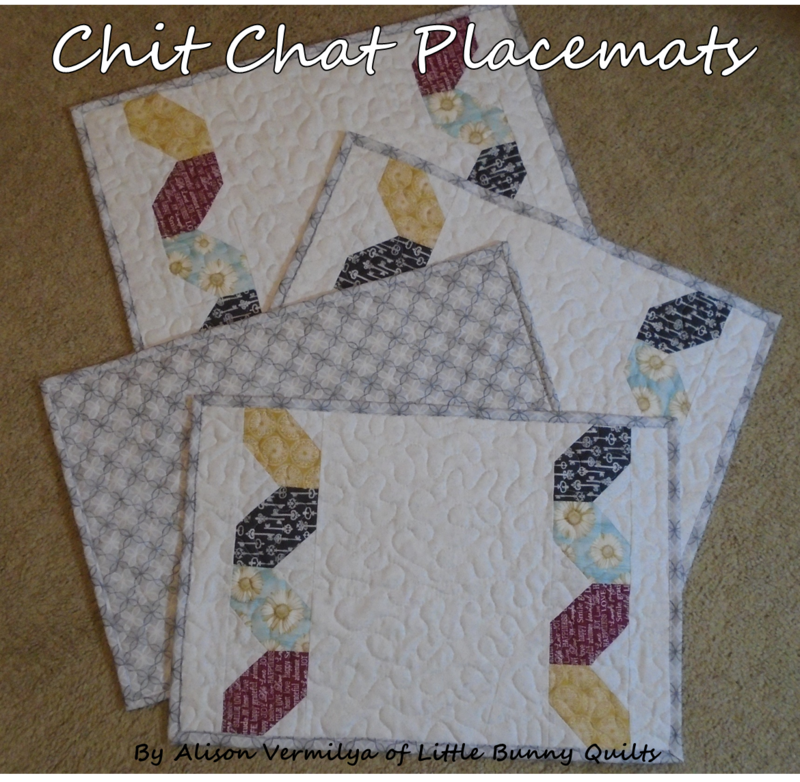 I also have two more posts that I need to squeeze in between now and Monday on my last two finishes of 2018 -- hopefully one will be posted tomorrow and one on Saturday! 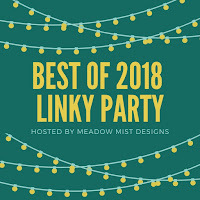 Make sure to visit all of the other "Best of" posts at Cheryl's link up!